There are very few non-chocolate desserts that I will give the time of day. My absolute favorite non-chocolate dessert is butterscotch brownies, which continue to baffle me with their non-chocolaty deliciousness. There are some things that cannot be rationally explained and I believe this is one of them. Next on my list of acceptable non-chocolate desserts is tiramisu, but only a handful that I have tasted in my life are up to snuff. One absolute deal-breaker is any trace of almond. In my opinion, it does not belong in tiramisu. 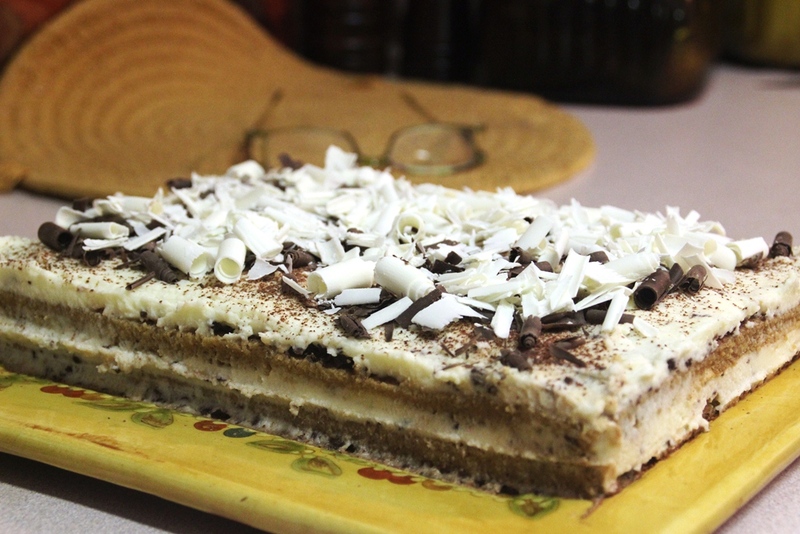 I tried to make tiramisu once before in my life. It was not a success. I went a little overboard on the coffee and put in about twice what the recipe called for because those lady fingers just didn’t look saturated enough as I was assembling the dessert. The next day, my tiramisu was sitting in a puddle. The taste wasn’t bad, but I definitely had a texture issue to work out. 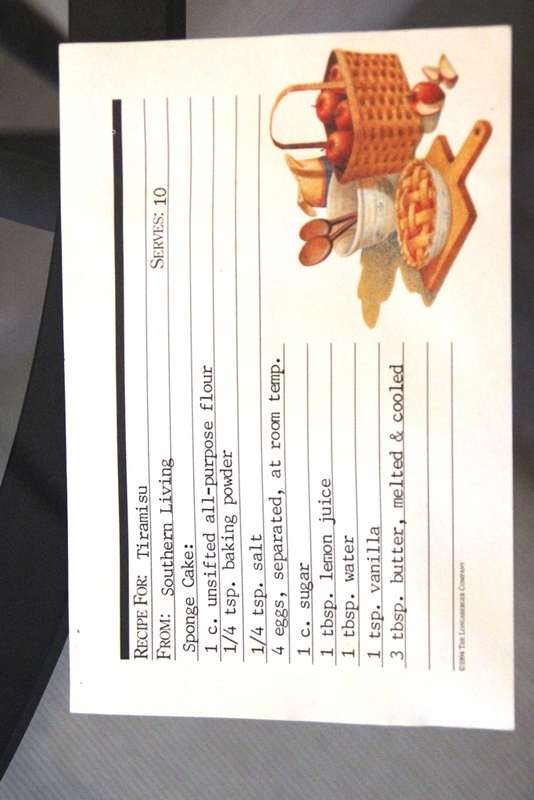 Unfortunately, I had volunteered to make this dessert because my mom’s boss and his family were coming over for dinner. They were sports and cleaned their plates. 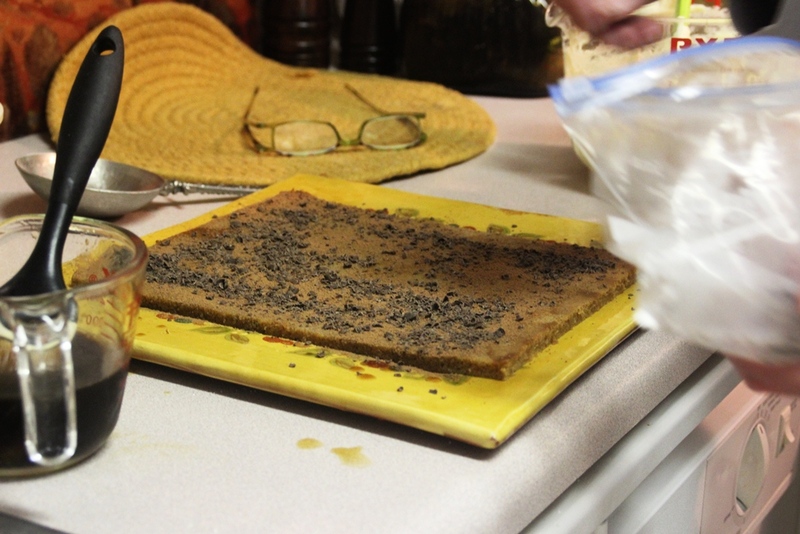 It was on that fateful day that I learned firsthand the valuable lesson that one should never prepare an unfamiliar dish for the first time when company is coming over, particularly company you would like to remain in good standing with. Instead, I would highly recommend preparing something that you have perfected. My mother did not get fired in case you were wondering. Since my tiramisu had knocked me down instead of picking me up, it was a while before I was emotionally ready to tackle it again. 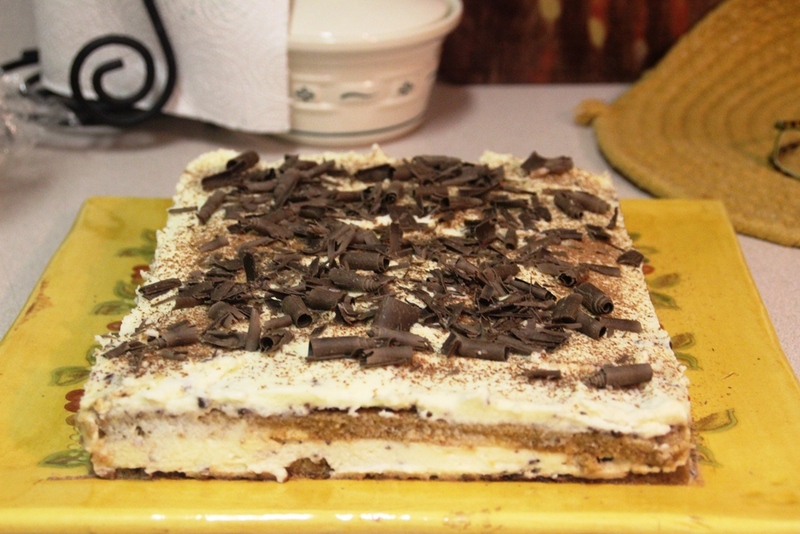 My neighbor Anna is Italian and a wonderful cook and baker, so I decided it was safe to try to make tiramisu again with her. 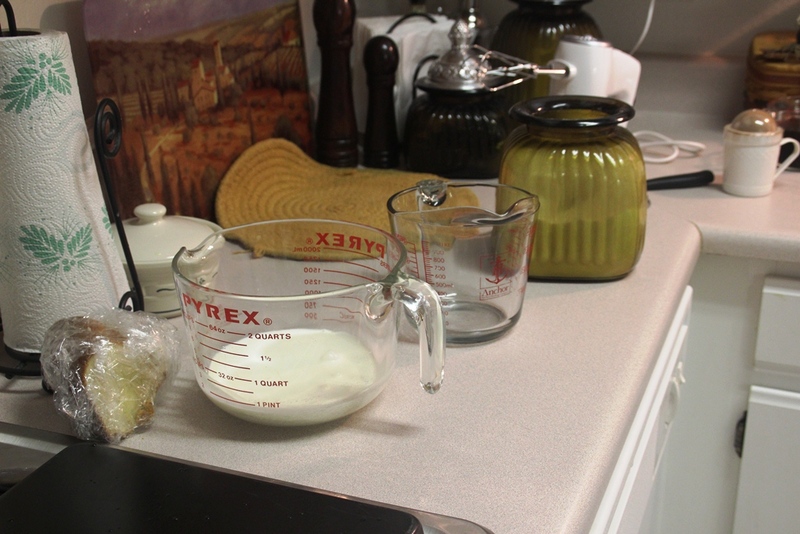 I only allowed myself to measure the dry ingredients and did not deviate from the recipe in the slightest. 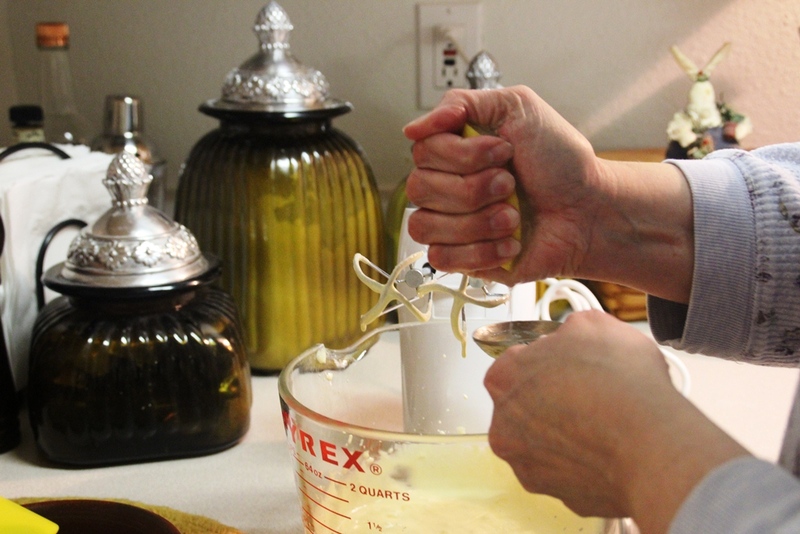 When Anna and I were discussing the ingredients for the dessert, I offered to pick up the lady fingers. 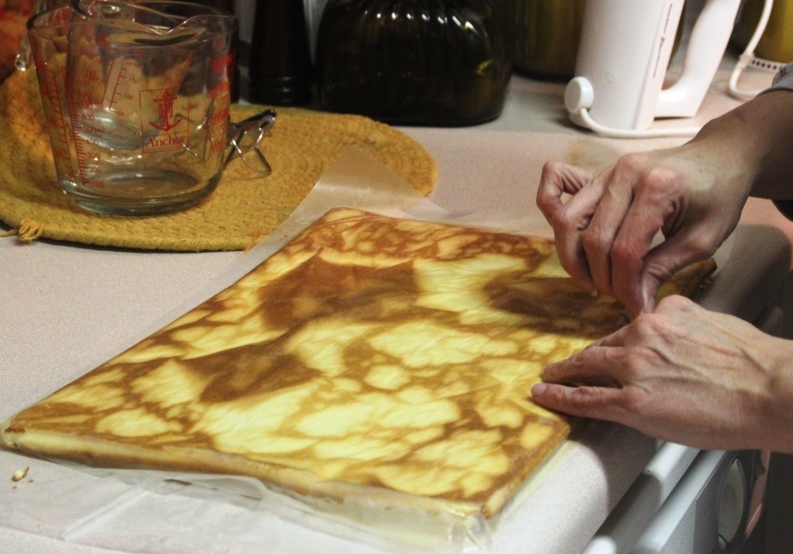 She informed me that that would not be necessary as we would be making the cake portion ourselves because it would be a better texture and flavor. Boy was she right on about that. 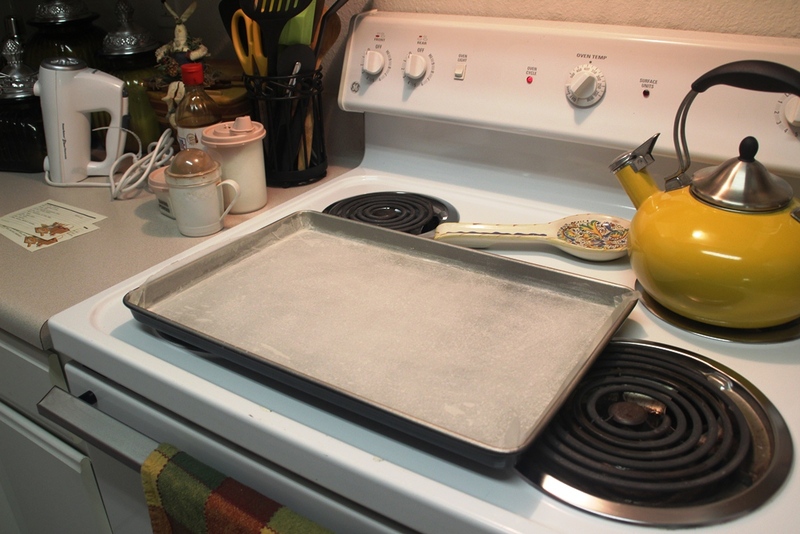 Preheat the oven to 400 degrees and line a half-sheet pan with wax paper and then butter and flour the wax paper so the cake does not stick. Separate 4 eggs and let them come to room temperature. 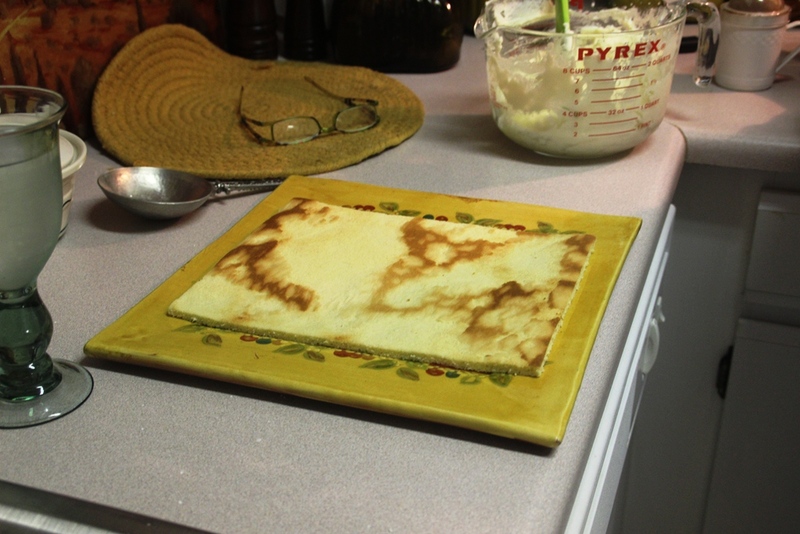 Melt 3 tablespoons of butter and let it cool. 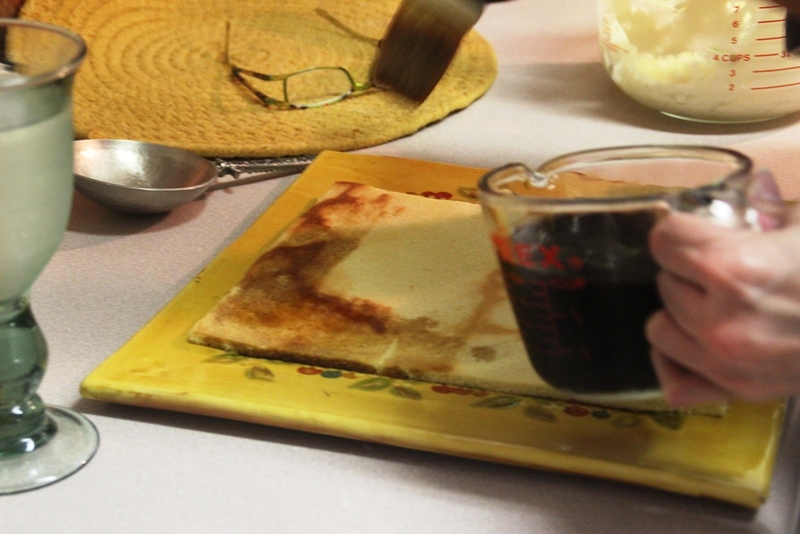 Brew some potent coffee and put 1 cup of it aside to cool. (I would recommend drinking the rest of it if you’re sleepy because this is going to take a while.) 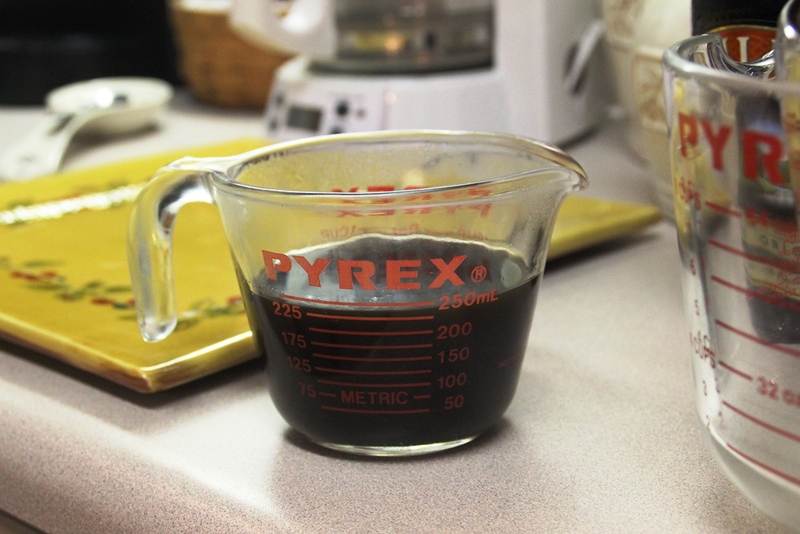 Add ¼ cup of sugar and a miniature of Kahlua to the coffee. 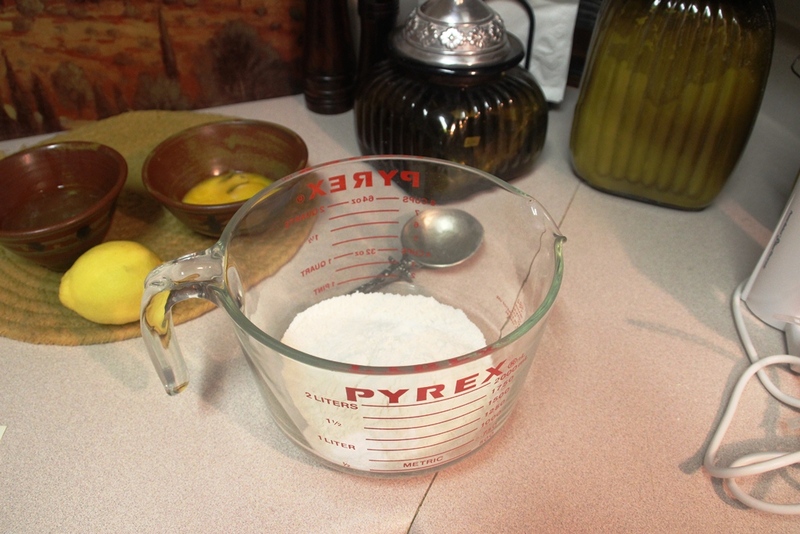 Sift together 1 cup of all-purpose flour, ¼ teaspoon of baking powder, and ¼ teaspoon of salt. 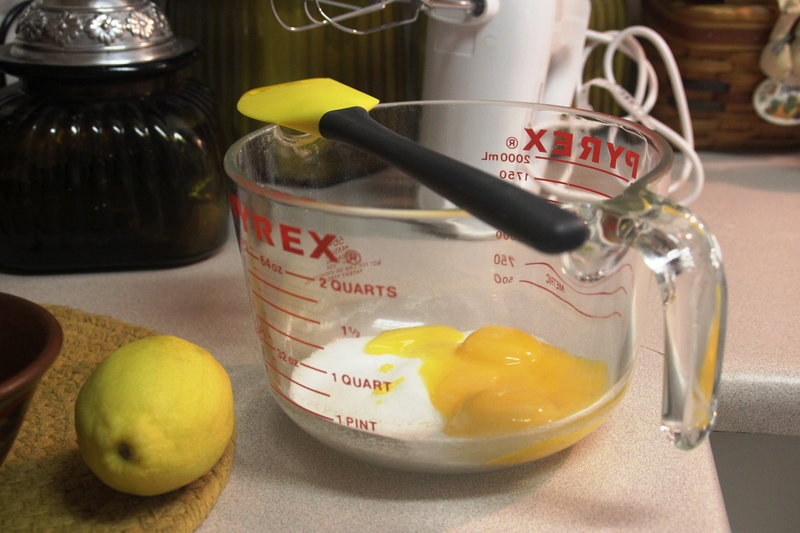 In another bowl, beat together the egg yolks and ¾ cup of sugar until light and thick. 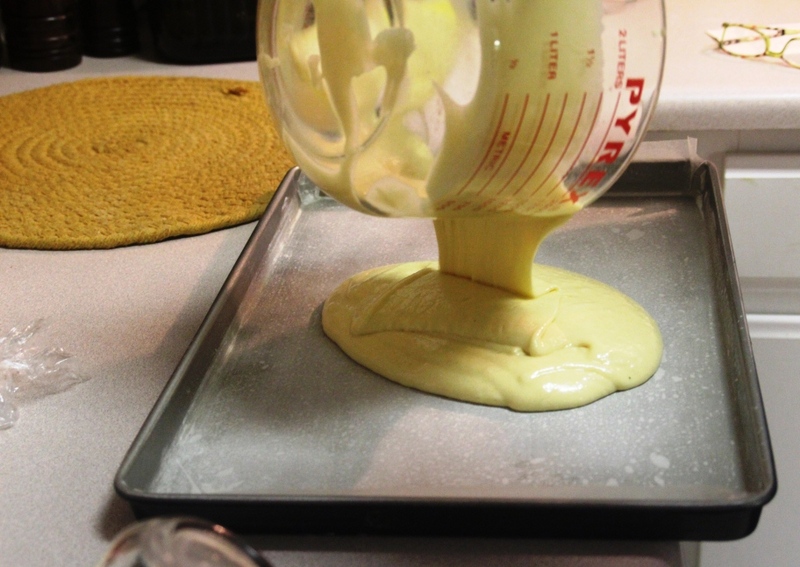 This will take about 5 minutes so I would recommend stretching beforehand if using a handheld mixer. It will look something like this when it’s ready. 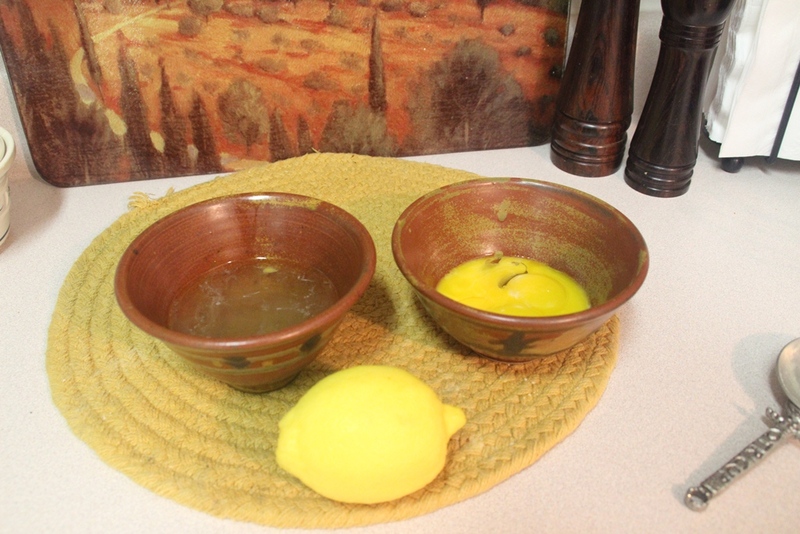 Then pour in 1 tablespoon of lemon juice, 1 tablespoon of water, and 1 teaspoon of ‘niller extract. 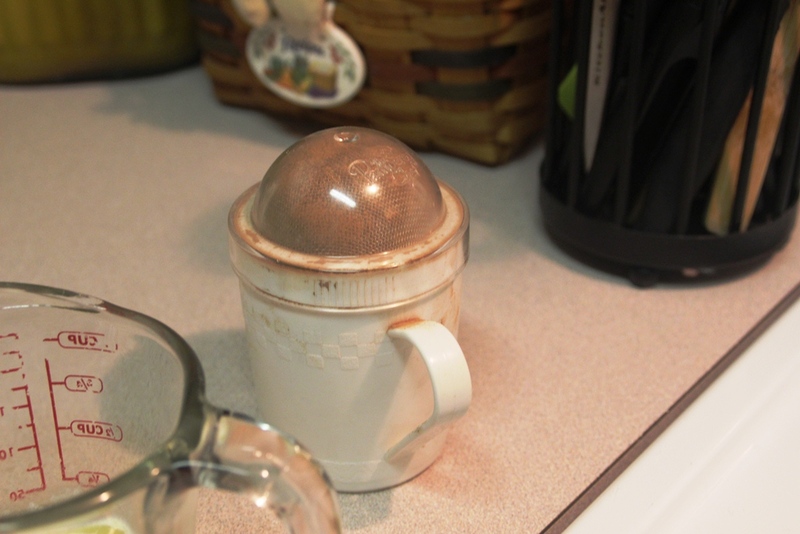 I also really like this nifty little gadget that allows one to dust cocoa powder on things. Sorry, I got sidetracked by the idea of something chocolate. 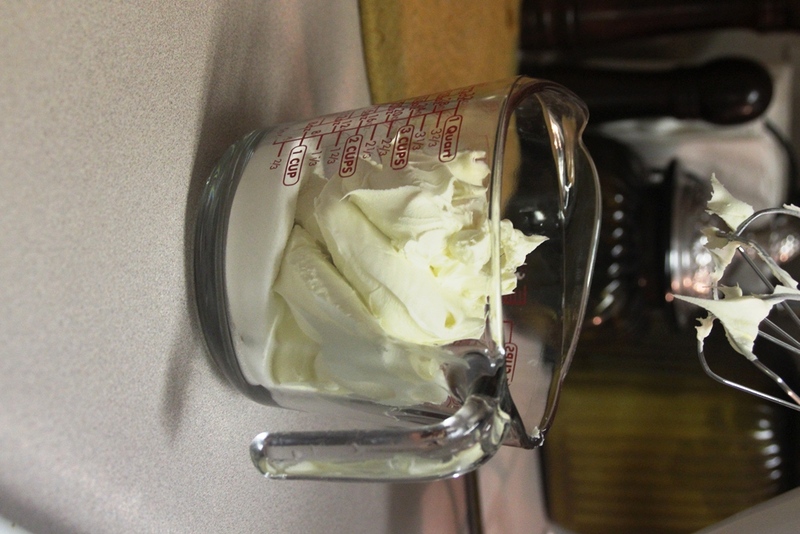 In yet another bowl, beat the egg whites on low speed until they are frothy and then add in ¼ cup of sugar. 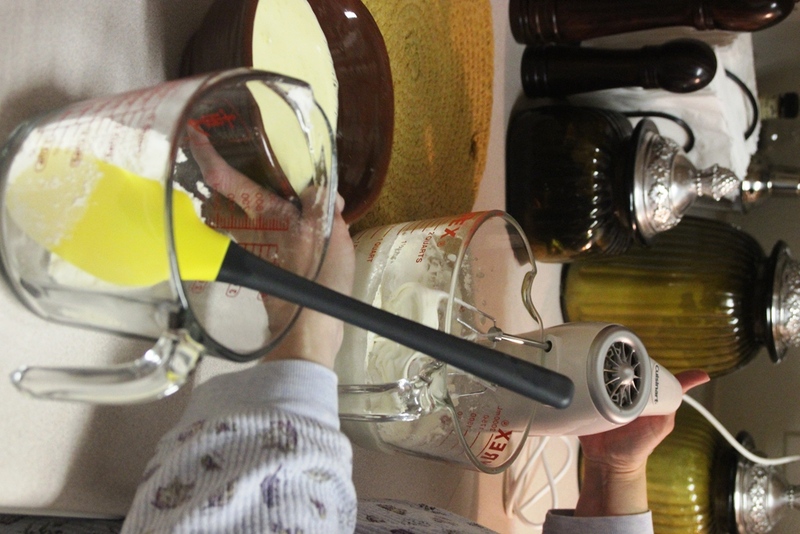 Increase the speed of the mixer to medium and beat the egg whites until they are stiff but don’t overbeat. 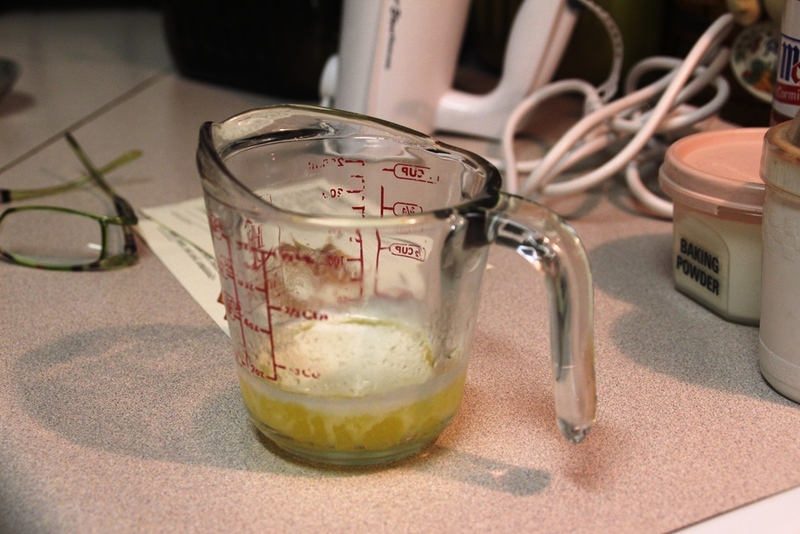 Add half of the egg white mixture and half of the flour mixture to the egg yolk mixture. Fold the mixtures together until combined. Repeat with the remaining half of the mixtures. 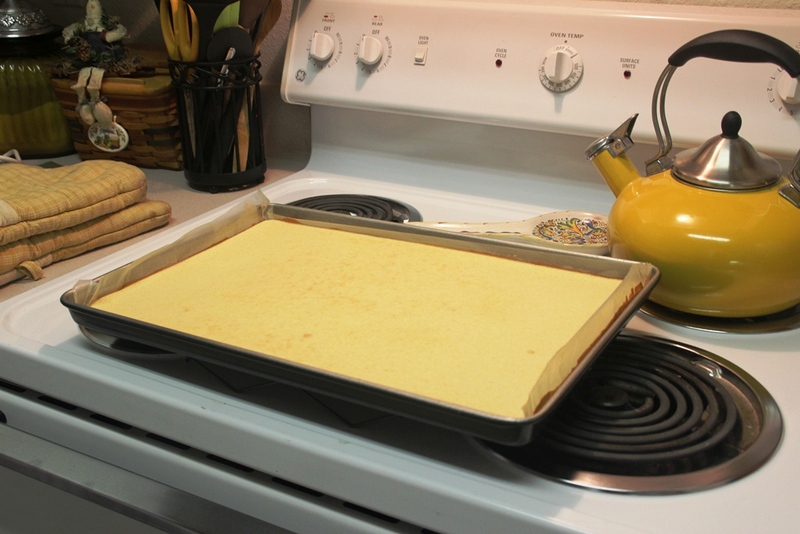 Pour the batter onto the sheet pan. 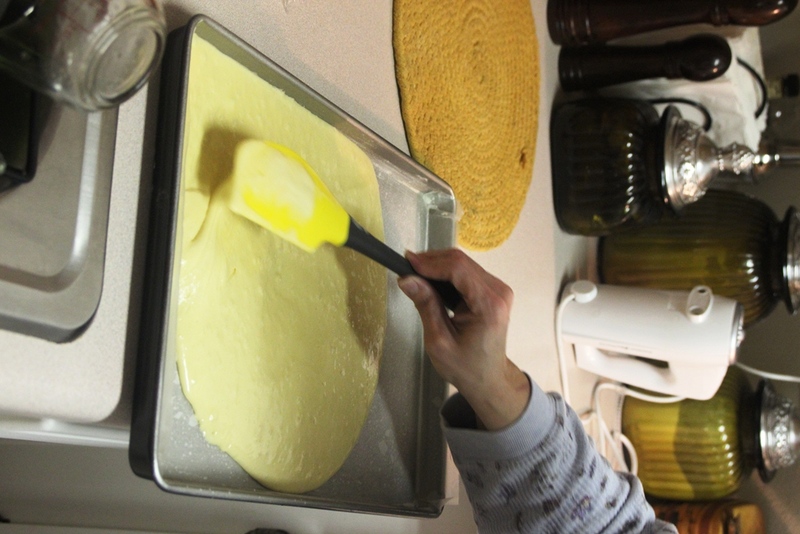 Spread the batter evenly across the sheet pan using a spatula. 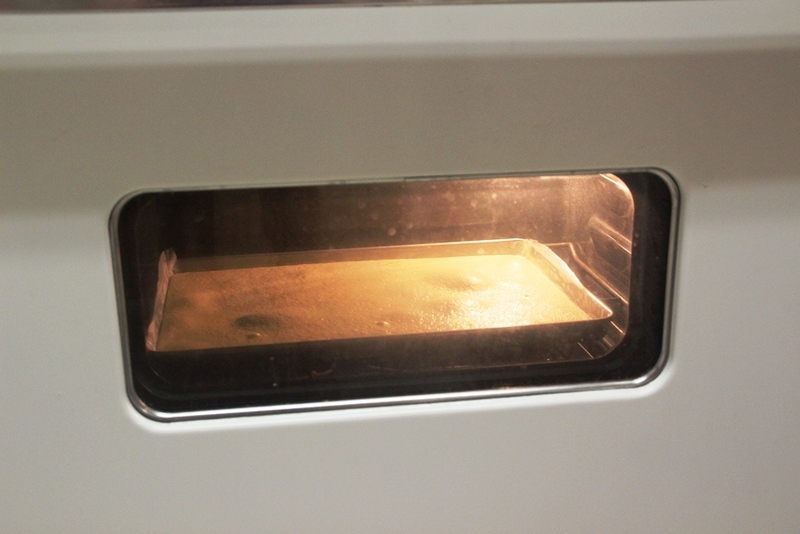 Then pop it in the oven for 15 or 20 minutes or until golden brown on top and the center springs back. 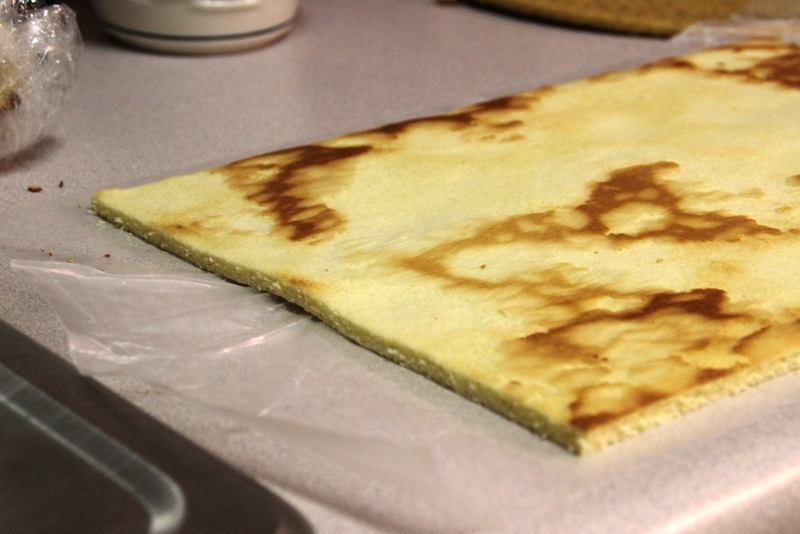 Let it cool for a few minutes in the pan and then turn it out onto wax paper and let it cool completely. 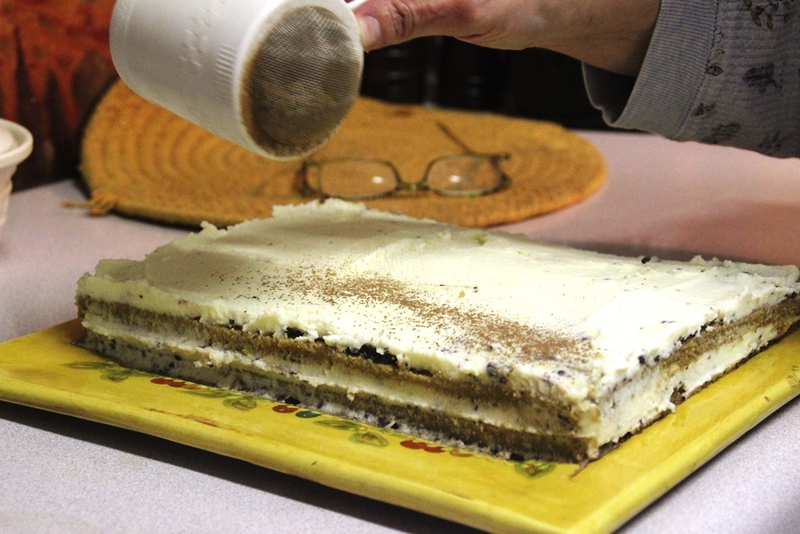 Carefully remove the wax paper from the bottom of the cake as that is not a texture you want in your tiramisu. 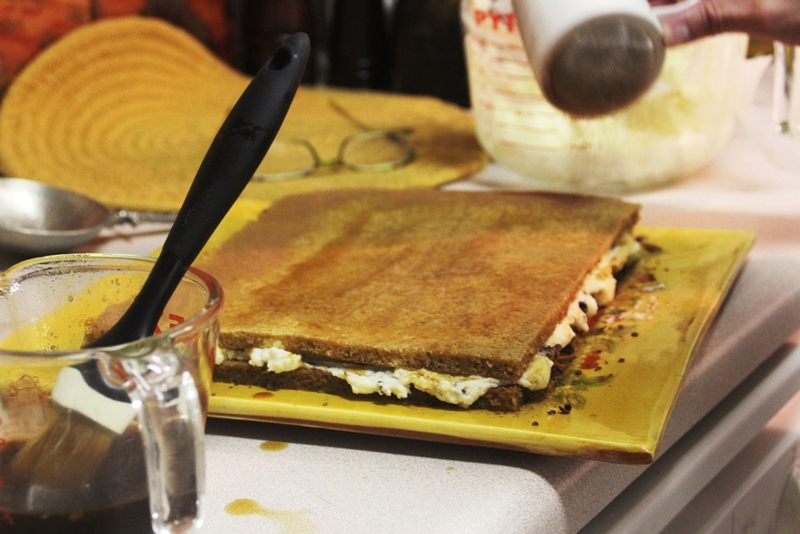 Then, cut off the edges of the sponge cake so no one has to experience a crunchy/stiff bite of tiramisu. Remember, it’s all about texture. 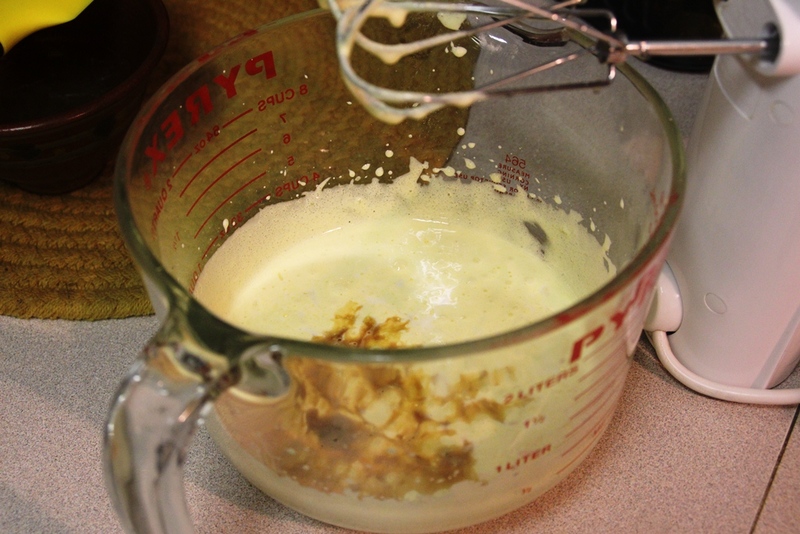 For the filling, beat 1 cup of heavy cream until it forms peaks. 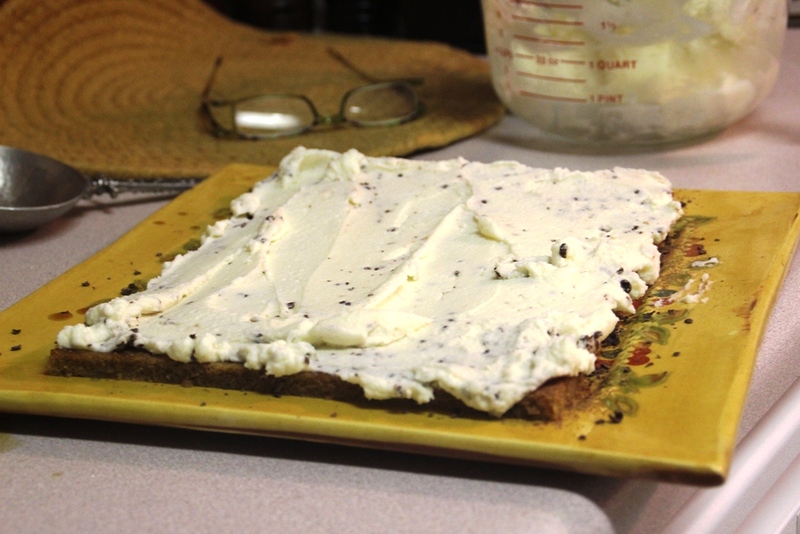 Then beat together ½ cup sugar and 1 pound of mascarpone cheese. 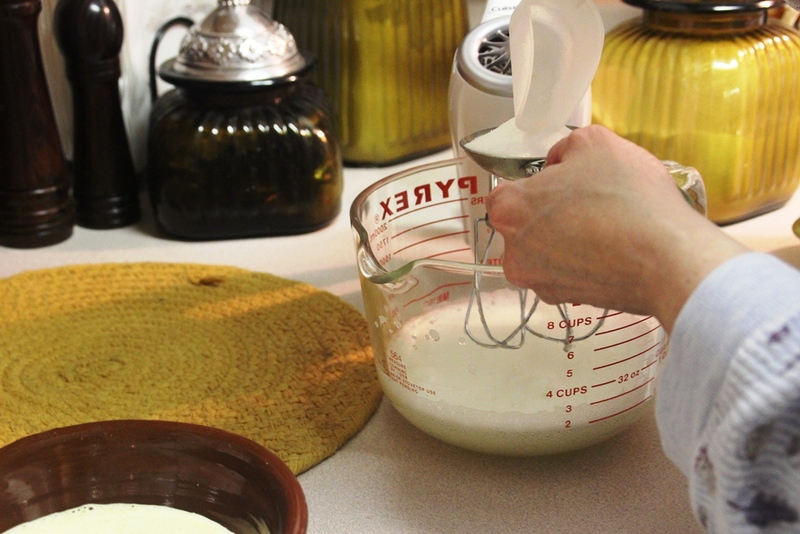 Fold together the mascarpone mixture and the heavy cream. 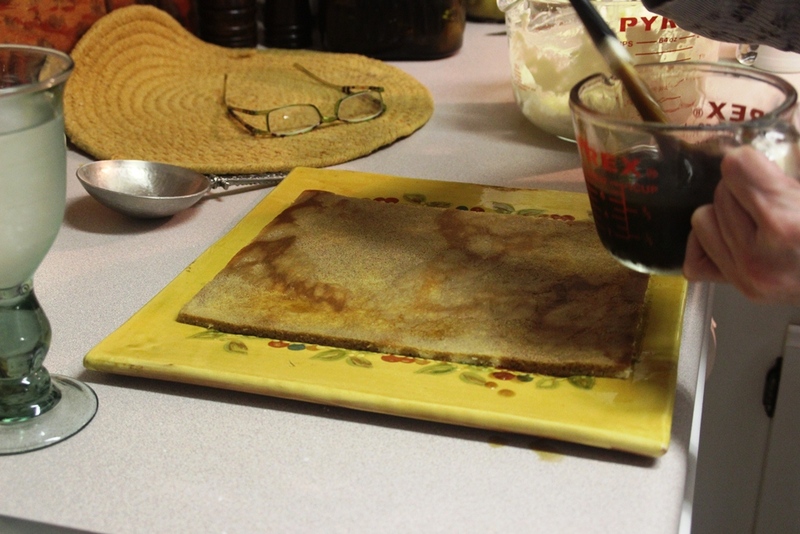 If you’re feeling rebellious, add a few drops of vanilla extract into the mixture. 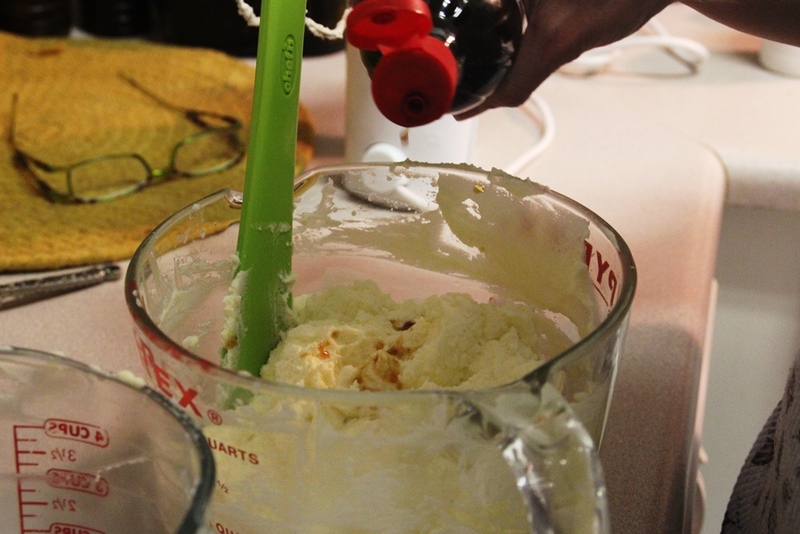 In my experience, a little extra vanilla extract never hurt anything. 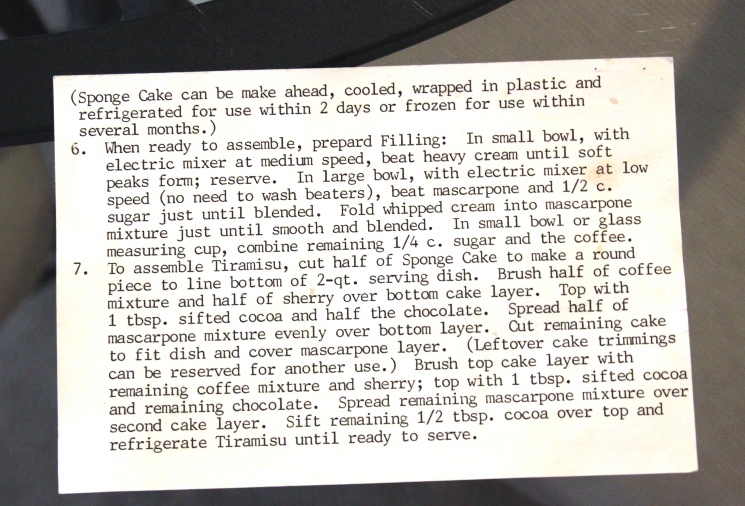 Next, cut the cake in half and place one half on a serving dish. 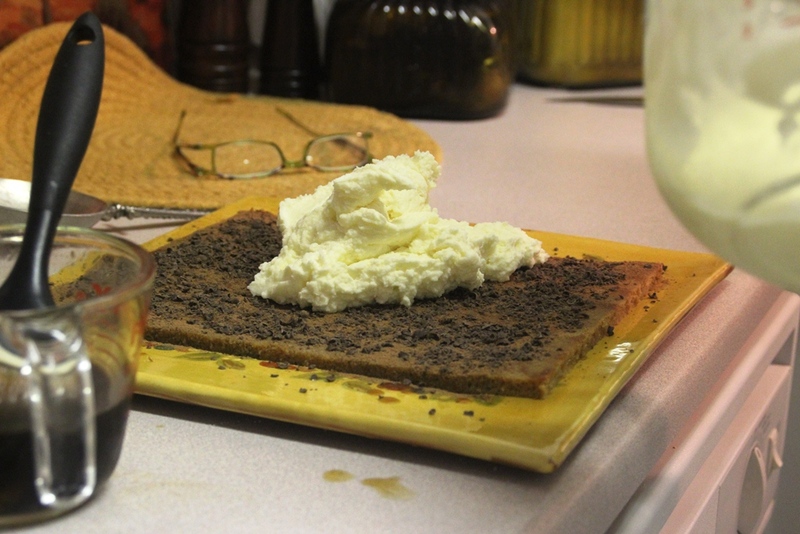 Brush half of the coffee mixture onto the cake using a pastry brush. 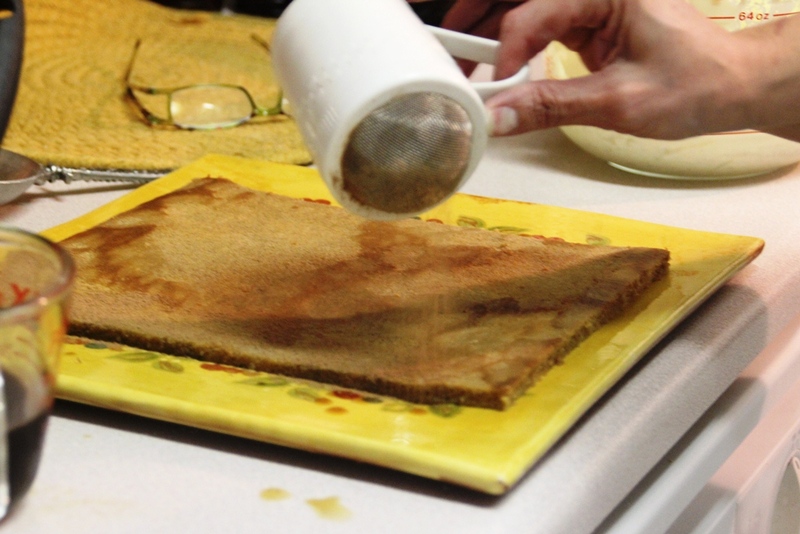 Dust the cake generously with cocoa powder. Then sprinkle on some chocolate shavings. 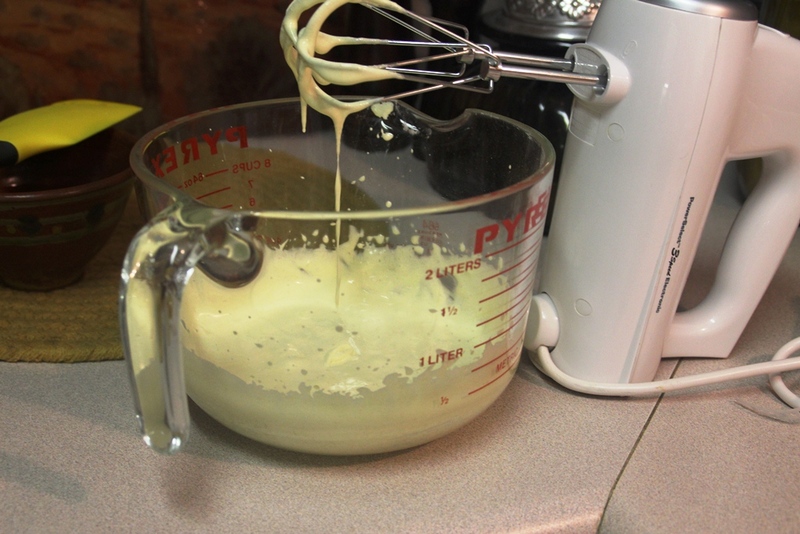 Spread half of the filling mixture over the first layer of cake. Easier said than done. Don’t be alarmed if some of the chocolate shavings get mixed in. No one will ever know and it will still taste good. 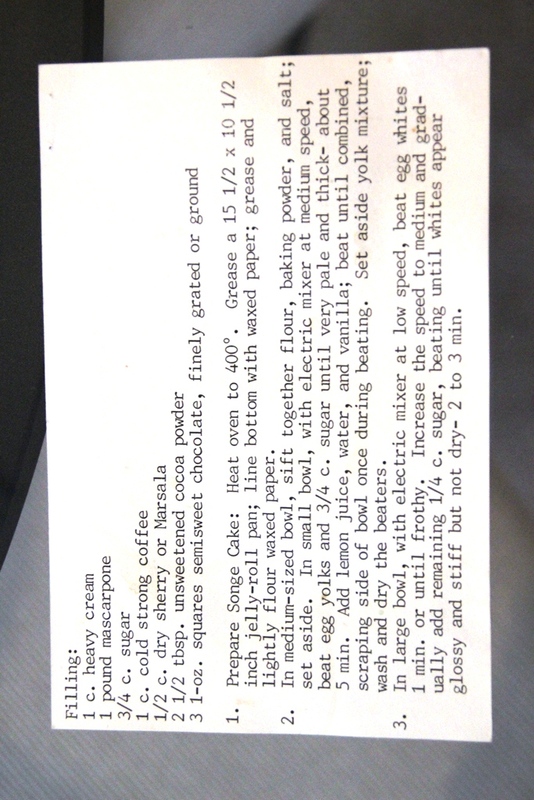 Repeat this process with the second layer of cake and filling. Cocoa powder and chocolate shavings. Smooth the sides with a knife. 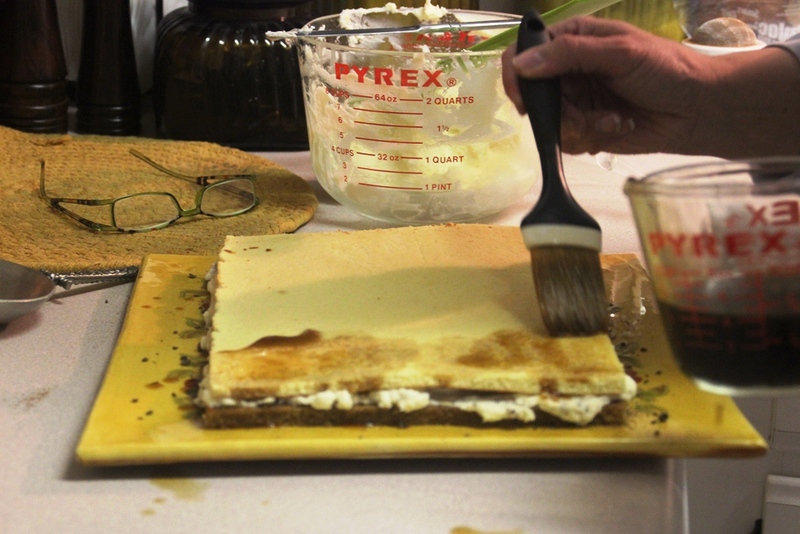 Decorate the top with dark and white chocolate shavings. 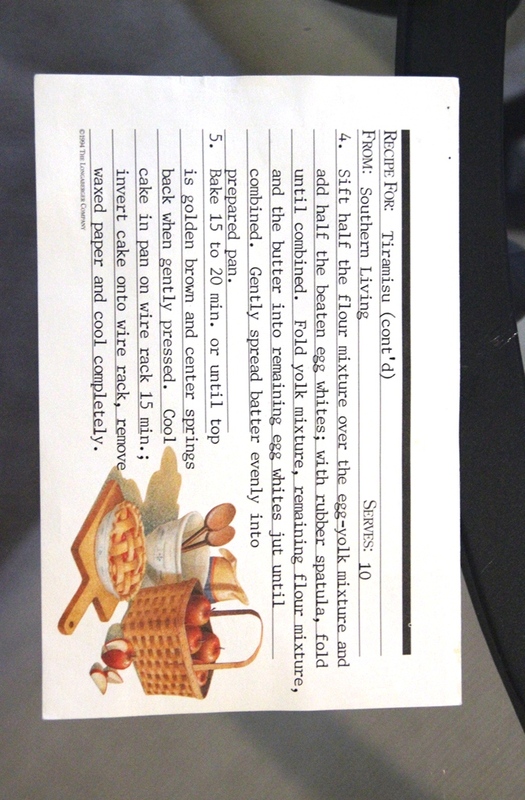 Then let the cake sit overnight in the refrigerator and enjoy the next day (preferably not with your mom’s boss unless this is at least the second time you’re making this recipe). Cousin Lauren came down to visit me here in Nashville the other day. 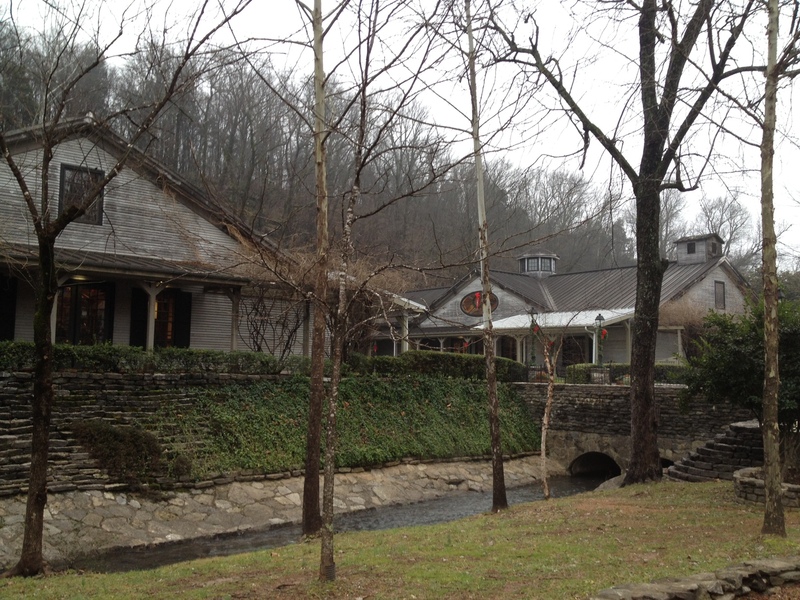 After some lunch and a trip to Comcast to switch out my cable box (I’m so much fun to visit), we headed to Lynchburg, Tennessee for a tour of Jack Daniel’s Distillery. As we neared the distillery in the car, cousin Lauren remarked how another distillery she had driven by had these creepy old buildings. Moments after we stepped out of the car, we determined this place was creepy, too. Must be a distillery thing. And the fact that it was miserably cold, damp, and foggy. Other than that, it was a perfect day for a distillery tour. I’m such a great host. This was pretty nifty. 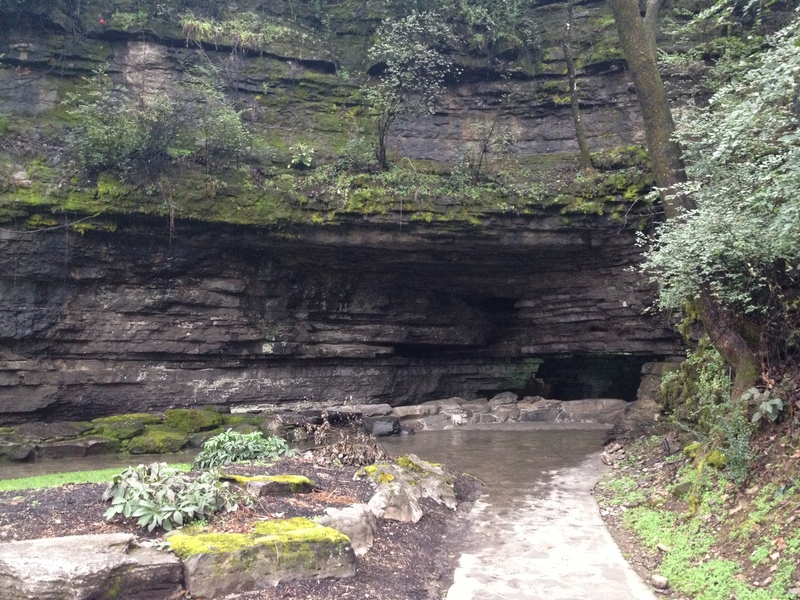 There is a natural source of water under this here hunk of rock that is used in the production of Jack Daniel’s products. Apparently it’s some pretty pure stuff and makes Jack Daniel’s whiskey taste real good. How do people figure these things out is what I want to know. This is not a black and white photo in case you were wondering. 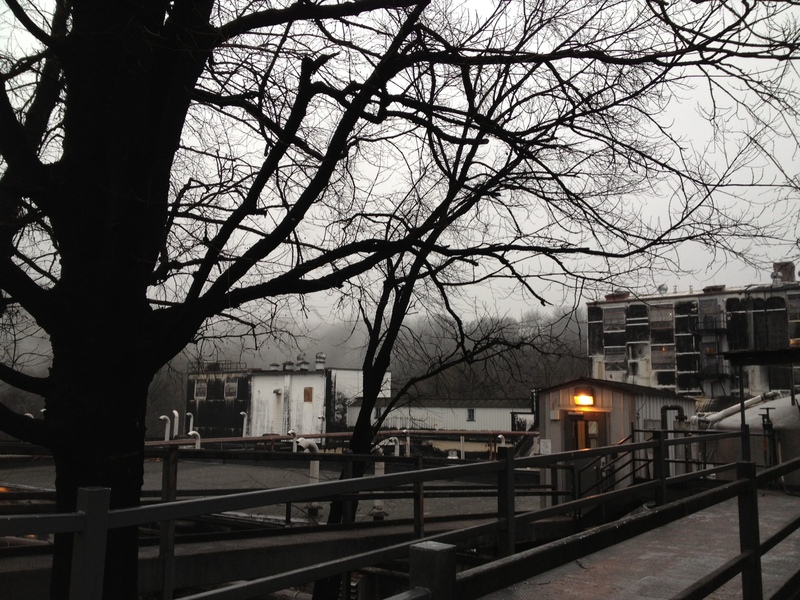 After we went through the buildings where the whiskey is produced, we found ourselves by some very black trees. 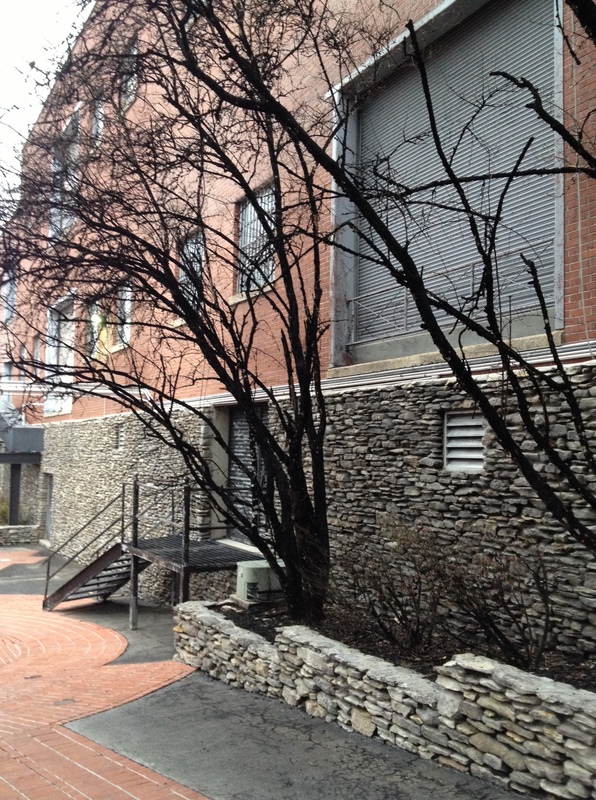 The trees turn black from a mold that grows on them as a byproduct of the distillery. Our tour guide assured us that the mold is not harmful to the trees or to people and is in fact a sign that the production of whiskey is going well. Looks can be deceiving! In the next building, where the whiskey drips through 10 feet of hard sugar maple charcoal to be purified, our tour guide lifted the lids of the large containers so we could smell the whiskey. We got a huge whiff of the whiskey, which made me think of bourbon balls as the smell lingered in my nostrils. I’m glad we got that cleared up. It was really troubling me. Towards the end of the tour, I asked our tour guide where she was from because she clearly did not have a southern accent and had been asking people in the group where we were from. Coincidentally, she was from Massachusetts, where I lived for 13 years and moved here from in April. I asked her where in Massachusetts she was from and she told me Salem, a town famous for the witch trials that occurred centuries ago. These creepy trees would fit right in there. All I have to say is, this world is tiny. And I like bourbon balls. And try to arrive at the distillery before 2:30PM if you would like a tasting tour. This year marked a big transition in tradition for the Dyer household. Instead of having our family Christmas at my parents’ house as we have always done, I hosted here in my new hometown of Nashville. In my one bedroom apartment. I didn’t foresee an issue as I have a large sectional that can sleep two people so I knew all four of us would have a comfortable place to sleep. What I didn’t foresee was the blanket shortage. I wound up sleeping under my robe. It’s ok though. Santa still showed up and we had our family Christmas. I may need a bigger place if I plan on hosting regularly. After our family Christmas on Christmas Eve morning with just me, Eugene and my mom and dad, we headed to Kentucky for Christmas on Christmas Day with the extended family. We always sleep at my dad’s parents’ house on Christmas Eve. My aunt, uncle and cousins live just down the road so they do their family Christmas early in the morning and then head to my grandparents for the big family Christmas on Christmas Day. Christmas morning, Granny made sausage gravy and biscuits. Man that stuff is good. I certainly couldn’t eat it every day but then again my great grandparents did and they lived into their 90’s so maybe there’s something to that. I’ll have to ponder that at a later time when I’m feeling less full. Per tradition, we started with our stockings. Among other lovely items, there was a Starbucks gift card, which it looks like I could have used that morning if the nearest Starbucks weren’t over 70 miles away. After the stockings, we moved into the living room and the youngins passed out the gifts. Eugene found a tagless gift, which was cause for great concern. My mom and Aunt Vickie received some money in shot glasses from Santa (Papa). I found this hilarious. I’m glad Aunt Vickie thought so, too. Granny got her box of tide with a dollar bill from Papa. He’s been doing this for decades and I’m still not really sure how it started. Maybe someday I’ll get to the bottom of it. After Christmas at my dad’s parents’ house, we headed down the road (literally) for Christmas with my mom’s parents. 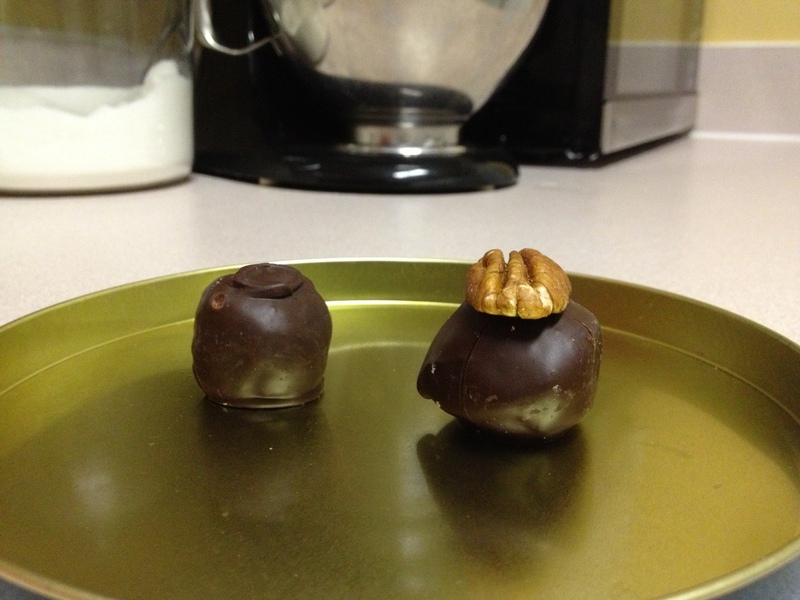 I went straight for a bourbon ball….or two. I have a wicked sweet tooth and there’s no telling when it will strike. We settled into the living room and opened our gifts. It wasn’t the same without my aunt, uncle and cousin on my mom’s side, but we were certainly thinking of them and wishing they could have been with us. After seeing the photo that my parents sent out unsupervised in the family Christmas card this year where I look possessed, Eugene and I insisted that we supply suitable photographs for next year’s card. We had my dad take about 437 photos and this was one of the better ones. With cameras retired for the day, we ate the delicious Christmas dinner that Grandmother had prepared for us. Then I had a few more bourbon balls and a piece of rum cake. We played a game of Scrabble, one of our favorites. I wasn’t on top of my game. There’s only so much you can do when dealt X, B, J, H, L, L, T. That, and most of the blood in my body was likely trying to aid in the digestion of the forty pounds of food I had eaten in the past few hours instead of pumping through my brain for a stroke of vocabulary genius. And then I might have had another bourbon ball. And then some leftover dressing from Christmas Eve dinner back at Granny and Papa’s. And a piece of the jam cake cousin Lauren and I made on Thanksgiving and let ripen for Christmas. It was scrumptious. I think I’ll be full until next year. These things are the devil.